The original superbly constructed house at 50 Calibogue Cay North is now a designer’s dream on steroids. Endless potential to craft this home into your very own ideal Island retreat. 50 Calibogue Cay North was recently expertly raised to a new height of 15′ to meet current flood guidelines for the coastal region. 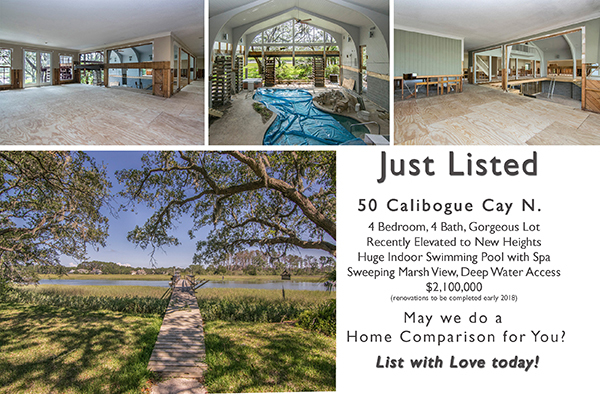 In doing so, this four bedroom, four bathroom house is now elevated so that it is nestled high among the gorgeous Live Oaks, garners sweeping waterway and marsh vistas out to the protected wetlands and has a fabulous two-story indoor pool entertainment patio. Now is the time to puchase 50 Calibogue Cay North so that you may direct the interior layout, design upgrades and interior styling to your preference. As time progresses, fewer options will be available as restoration moves forward. Currently the interior of this house features a living room, kitchen, great room, dining room, office and large foyer. The indoor, heated-pool patio is now one of the central, dramatic attributes of this house. The exterior currently includes an outdoor kitchen, large patio and private dock. The deck configuration is being considered at present. Come see why we are raving about this fabulous home.